Deanna Cohen is a speech-language pathologist in the Rehabilitative Services department. She earned a master's degree in Speech-Language Pathology from Loyola University Maryland. She completed her clinical fellowship year at UMMC, focusing on evaluation and treatment of swallowing, oral communication, and cognitive linguistic disorders. 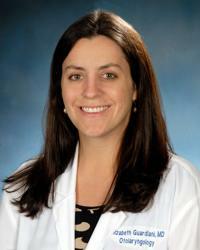 Her clinical focus is adult voice and swallowing disorders, including head and neck cancer rehabilitation. She has a special interest in tracheoesophageal voice prosthesis (TEP) management for patients with total laryngectomy. She is certified in Lee Silverman Voice Treatment (LSVT), a intensive approach for treatment of speech/voice disorders for patients with Parkinson's Disease.